The APSE (Association for Public Service Excellence) event is held every Spring at Colyumbridge, near Aviemore in Scotland. It attracts professional transport people employed by Scottish and North English local authorities and the contractors that work for them. 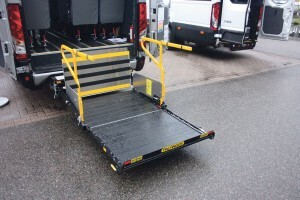 As a result it has become very popular with producers of wheelchair assessable minibuses and this year was no exception. Some companies have supported the event for many years but this time there were two new ones in the shape of Minibus Options and EVM. EVM is a new player in this market following the introduction of it’s directly wheelchair accessible Sprinter called the Community. They are rapidly gaining an enviable reputation across the sector for the quality and the value for money of the vehicles they are producing. In its first year of production, sales of the Community are already running well ahead of predictions. At the event they also introduced the prototype of their second model aimed at the sector, an M1 eight seater wheelchair accessible vehicle with some interesting and unusual features. The Community has direct wheelchair access through the wide side door on to a flat floored area. In this area there is one fixed seat and three tip-ups in the wheelchair bay. There is then two steps up to the remainder of the saloon where there are 12 more seats. EVM have made some detail changes to the Community since it was first introduced, most notably changing from a single, rearward opening, plug door to a pair of smaller outward opening plug doors, one opening rearward and the other opening towards the front of the vehicle. They have changed the doors to achieve a quicker closing rate. The vehicle on show also had a luggage pen in the area where the front nearside seat would normally be positioned and it also had a unit for accepting a ticket machine. The Community is built using the long wheelbase Mercedes-Benz Sprinter 516 with 163bhp Euro6 four cylinder diesel engine and is fitted with the seven-speed 7G-Tronic fully automatic transmission. A six speed synchromesh transmission is available as an option. To achieve the low floor, the drive from the transmission passes through a drop-box and the prop shaft is cleverly routed through the floor to avoid damage from sleeping policemen. 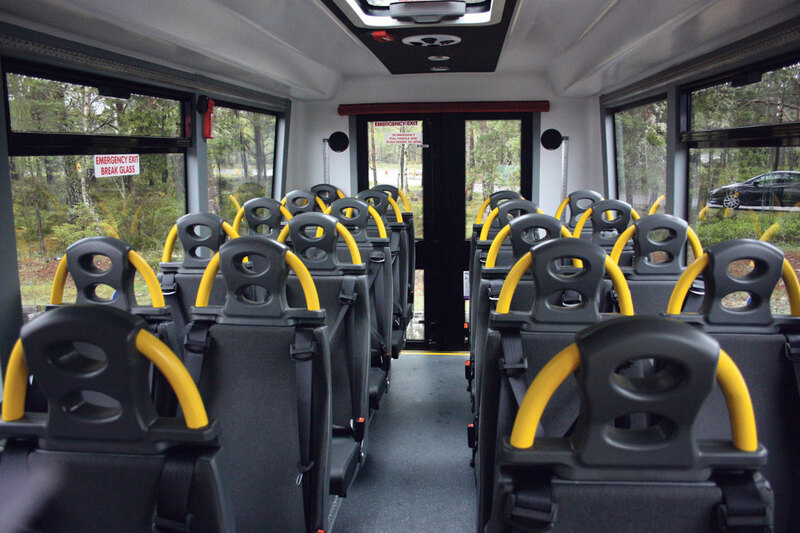 The new M1 eight seat Sprinter is built on a Sprinter 313 or 316. It has eight single tip and fold seats which can be folded against the vehicle side to create up to four wheelchair spaces. The vehicle has a special floor which incorporates the clamping system for the wheelchairs. The system can clamp conventional and powered wheelchairs. It is also fitted with an AMF Bruns in-board mounted, 400kg capacity wheelchair lift at the rear. We will be bringing you a detailed look at this interesting new product in a future issue. Minibus Options first conversion of the Iveco New Daily destined for Culverdale CT.
Whilst Fred James and Nigel Povey from Minibus Options have visited the event before, they have never exhibited at it. 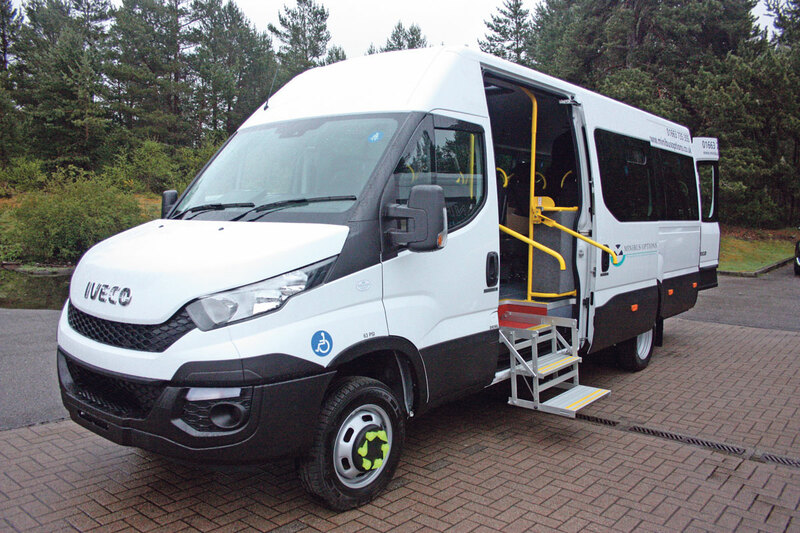 They used the show to launch a new product in their range of wheelchair accessible vehicles, a conversion of the New Iveco Daily, the first one they have built. The vehicle was fitted with Hi-Matic automatic eight-speed transmission. The vehicle featured a fold out step arrangement at the side entrance, 16 AMF Bruns Smart seats and also the same company’s Smart floor system. It can alternatively carry three wheelchairs. The design can be seated for up to 22 passengers or alternatively eight wheelchairs. It was also fitted with a PLS underfloor mounted cassette style wheelchair lift. The vehicle is being supplied to Culverdale Community Transport under the DfT Minibus Scheme for which Minibus Options is the main contractor. 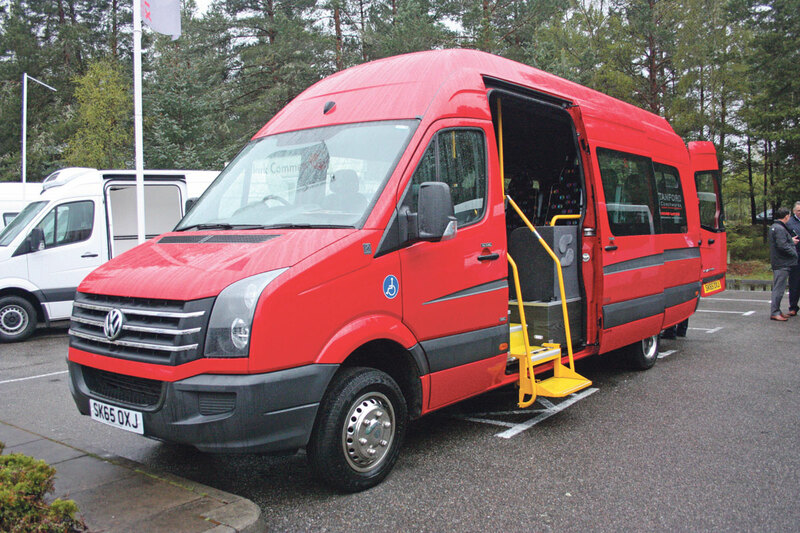 Minibus Options have also produced a Minibus Buyers Guide aimed primarily at those who may use accessible vehicles but for whom they do not form the core of their business. It explains in simple language the various options available and even established operators will find it useful. Copies are free of charge and can be obtained by contacting Minibus Options. Treka Bus Treka 16 Sprinter destined for Enterprise Flexi-Rent. Treka Bus showed a coachbuilt Treka 16 built using the five tonnes Mercedes-Benz Sprinter chassis cab as a base. The vehicle featured a Treka Bus fold out step at the side entrance, a PLS wheelchair lift mounted at the rear and an audible warning system to alert cyclists to the vehicle turning left. Inside, it was fitted with 16 Phoenix seats and Eberspacher heating and air conditioning systems. 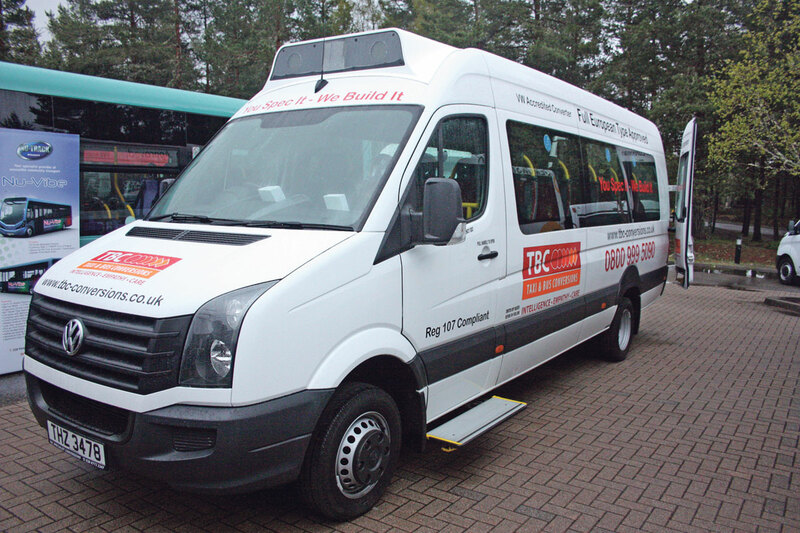 The vehicle was one of an order for ten being supplied to Enterprise Flexi-Rent, a regular Treka Bus customer. It will join their Transport Service Solutions fleet. 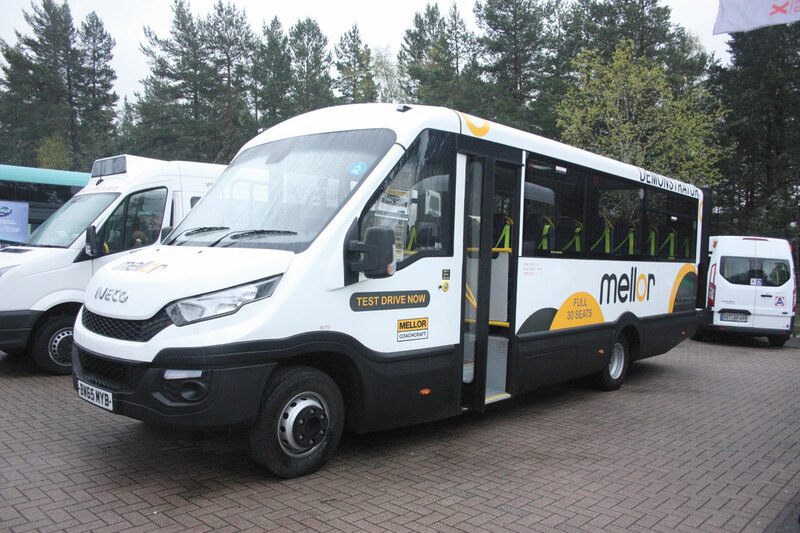 The Mellor Maxima on Iveco New Daily can seat up to 30. Mellor used the event to show their new Maxima coachbuilt wheelchair accessible minibus which is built on to the Iveco New Daily 72C17 chassis cab. The vehicle is fitted with the 170bhp Iveco 3.0 litre diesel to Euro6 matched to eight-speed Hi-Matic automatic transmission. 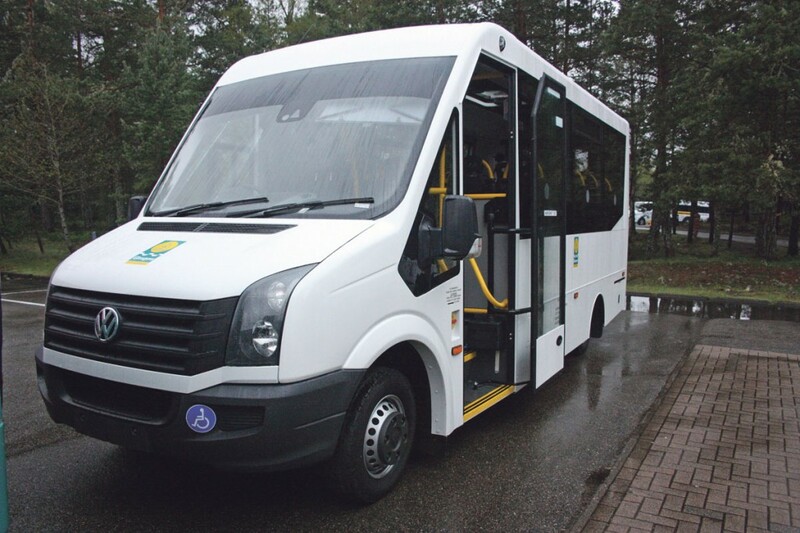 The vehicle can seat up to 30 passengers using lightweight seats or alternatively it can carry two seated passengers and up to six wheelchairs. The vehicle was fitted with Phoenix Hydra Compact seats and Eberspacher air conditioning. It also had an in-swing powered side entrance door with Mellor’s fold out additional step. At the rear it was fitted with a Ratcliff-Palfinger wheelchair lift. VW Crafter built by TBC to comply with Regulation 106. The Northern Ireland based vehicle converter showed a VW Crafter CR50 compliant to Regulation 107. The vehicle had seating for 16 or alternatively six wheelchairs. It featured an AVS extra step at the side entrance and Braun Vista in-board wheelchair lift at the rear. The VW Crafter is very popular with local authority operators in Scotland. TBC also had a conversion of the VW Caddy to carry one wheelchair. The chair is loaded from the rear using a ramp system. The vehicle was shown on the John Clark stand. VW Crafter CR50 conversion by Stanford Coachworks. Stanford showed three vehicles at the event. Their first exhibit was a VW Crafter CR50 fitted with 15 Phoenix seats or alternatively it can take four seated passengers and five wheelchairs. It featured Stanford’s fold out step arrangement at the side door and a PLS underfloor wheelchair lift at the rear. The lift slots into the core of the Stanford safety floor to protect it from damage and water ingress. They showed another similar but 16 seat or 3 seat plus five wheelchairs, VW Crafter CR50 on the John Clark Group stand. John Clark are the largest VW distributor in Scotland and have used Stanford to produce bespoke accessible vehicles for their clients. Stanford’s third exhibit was the new Iveco New Daily 50C17 conversion that they showed at the CV Show. The vehicle is fitted with the eight speed Hi-Matic automatic transmission and was seated at 16 or alternatively can carry eight wheelchairs. 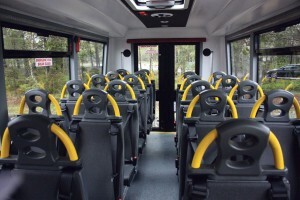 The vehicle can be seated at up to 22 seats. It was fitted with a new Ratcliff-Palfinger wheelchair lift at the rear. The new lift called the RUL40 has a 950mm wide non-slip aluminium platform and can lift 400kg. The second fold out section of the platform is spring loaded to make deployment easier. The 22 seat VW Crafter CR50 based Nu-Trak City Link, one of eleven being supplied to Glasgow City Council. Nu-Track had the largest accessible vehicle on show in the shape of a Nu-Vibe which has been developed from the Wrightbus Streetlite service bus. The Nu-Vibe uses the same Cummins engine and Allison automatic transmission driveline but it is narrower than the Streetlite and is directly wheelchair accessible via the side entrance. The vehicle was one of a batch being supplied to East Lothian Council and is the first in Scotland. It has seating for 33 or alternatively it can seat 19 and carry up to four wheelchairs. Nu-Track’s second exhibit was a City Lift based on the VW Crafter CR50 chassis which Nu-Track have had uprated by VW to 5.3 tonnes gvw. This enables them to achieve seating for up to 22 passengers using Rescroft seats. It has a rear underfloor mounted wheelchair lift. The vehicle is one of eleven being supplied to Glasgow City Council. Talking to Alistair Hammill, Nu-Track’s designer, he told me that VW had now decided to adopt the upgrading of the Crafter to 5.3 tonnes across the board. He also confirmed that the current Crafter is not going to be upgraded to Euro6 until the new replacement for the Crafter is introduced in Spring 2017. He also told me that the new vehicle will also be available with fully automatic transmission as opposed to the automated system currently available. He also gave me details of a completely new model which is a coachbuilt version of the 72C17 Iveco New Daily called the Stellar. The vehicle features an aluminium alloy body which meets R66 and provides seating for up to 30 passengers. 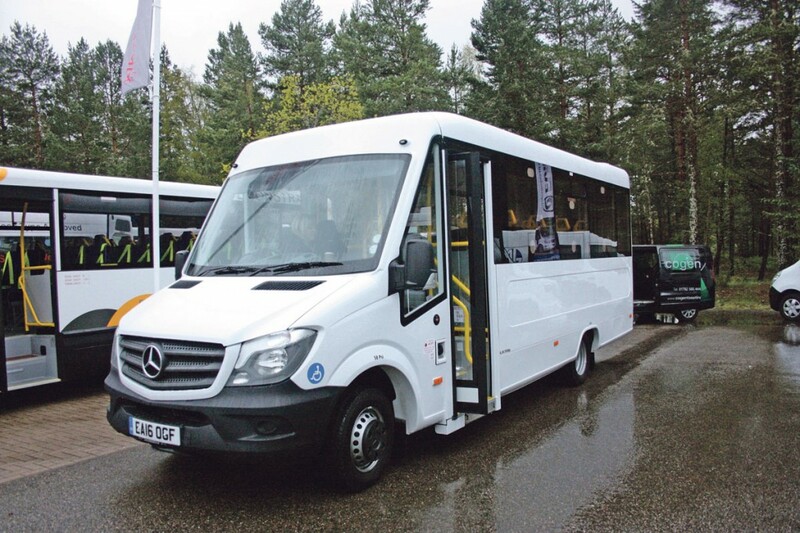 It can alternatively carry 22 passengers and two wheelchairs or eight wheelchairs and two seated passengers. Wheelchairs are loaded at the rear using a rear mounted underfloor wheelchair lift. The vehicle is available with either the Hi-Matic automatic transmission or a six-speed ZF manual box and has rear air suspension. The new Ratcliff-Palfinger RUL 40 wheelchair lift. The event is always well supported by the equipment suppliers and this year was no exception. Amongst those present were Phoenix, Rescroft and Cogent seating, Unwins, Q’Straint, AMF Bruns, PLS, Ratcliff-Palfinger and Eberspächer.